Lower Eyelid Reduction Surgery (also known as ‘Blepharoplasty‘) is used to remove excess folds of skin and bags from the lower eyelids. The cause of these excess folds of skin and bags under the eyes is ageing in general, excess of sun and genetics. The incision lines from this surgical proceedure are hidden just below the lower eyelid eyelashes. The results are rewarding, with recovery time seven days. Fine wrinkling of lower eyelid skin with no excessive skin is best treated with Vitamin A Obagi programme and the erbium laser. ii) Neck Lift / Liposuction to neck. The Lower Eyelid Reduction procedure recreates the youthful eye as seen in the patient at 25 years old. A smooth, well defined slightly curved lower eyelid is obtained. Lines and bags in the eyelid are eliminated. 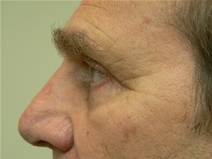 The lower eyelid blends in with the cheek prominence, without any demarcation. 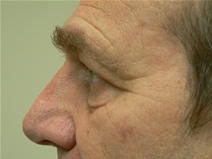 Heavy eyebrows / drooping eyebrows are elevated and repositioned onto the supra orbital ridge. Excess skin in the upper eyelids is then removed to open the eyes, significantly improving vision, and allowing an enhanced and youthful appearance of the brow to be obtained.